Moving a car is sometimes more logical than working your way around it, and the best car dollies (or tire skates) will make rotating or storing a vehicle easier than you ever thought it would be. Look for models that are well-designed and able to stand up to the weight of any vehicle you need to use your garage car dolly with. 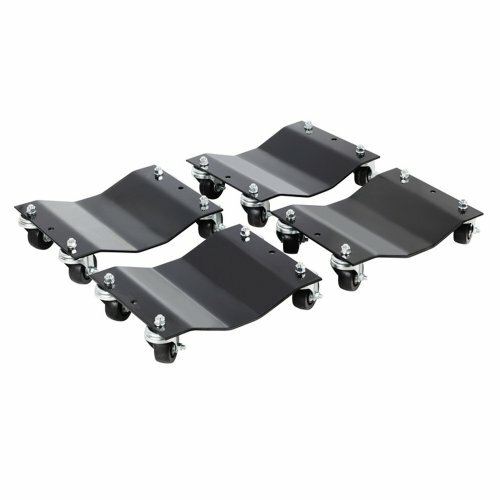 If the castors, for example, are not able to stand up to the stress of moving your car, then look for a heavier model. Whether you are restoring a classic or storing your ride for the season, the best tire skates are ones which fits your particular needs– whatever those needs may be. Pentagon is a relatively new drywall and automotive tool company that is based in Michigan and founded in 2006. Their large 12 x 16 inch plated steel wheels make it easier to move your vehicle once it is mounted, and the 3-inch ball bearings mean smoother movements and longer wear. Rated at 6000 pounds, this set of four tire skates makes for the best car dolly for restoration projects and medium to heavy vehicles. If you are a do-it-yourself kind of person, these skates give you 360 degree rotation and free rolling. And when you are done with the skates, they have an integrated storage hole so you can hang them from hooks. The patented castor design allows you to work with about half the force of other castors, giving you the same versatility found in professional mechanic shops. There is some assembly required, but the task is a lot easier than you may be expecting. You may need to pack the bearings now and then if you use your tire skates regularly, but that is the only real maintenance you will ever need to perform. Use these Pentagon tire skates sensibly and keep them lubricated and they will last you for a lifetime. Keep in mind that a smooth garage surface is easier than a rough one, and always be aware of hills or slopes if in the driveway. Short for Owatonna Tools Company, OTC automotive tools are made in Minnesota and have been since 1934. The 1572 model may be the top auto dolly for light and medium usage, including small SUVs. This pair will support as much as 3,600 pounds of vehicle. It features a patented clamp design that gives more dependable support and reduces the risk of slipping while in use. Having variable heights gives you more versatility, and each unit can be adjusted from 9 to 14 inches high for maximum adaptability. Since you are working with two individual pieces, you never have to adjust the width or match the tire placement, no matter which vehicle you are working with at the moment. To avoid scratching or damaging the frame, you will appreciate that each threaded lift saddle is topped by rubber pads which will not scratch or mar. 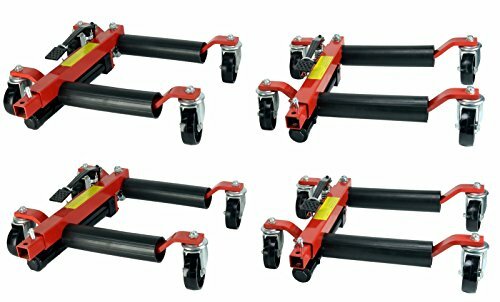 Unlike other types of car dolly, this set will allow you to move a vehicle with or without tires installed, adding a whole new level of performance. As far as problems go, there are not many to deal with, but the design does make storage a bit of a problem. Dragway Tools manufactures a variety of tools for use in the automotive industry, and their 4-piece hydraulic car wheel dolly set is a fine example. Each unit of the set is adjustable from 12 to 22 inches wide to fit tires of most sizes and is capable of supporting up to 1500 pounds. The patented design allows a single person to move even a large vehicle with ease, whether you are pivoting the vehicle on two dollies or using all four for total maneuverability. To use, you simply slide them under/around the tires. 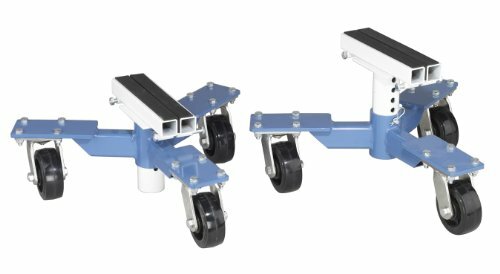 When you step on the included foot jack, it squeezes the two sides of the dolly together to lift the tire a couple inches off the ground. They’re super easy to use. The red powder coated finish resists scratches and stains better than ordinary paint, and the frame is built of heavy duty 1/2” steel for more durability. 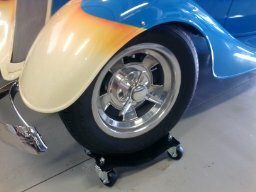 With 4 inch swivel wheels and 6 inches of clearance, a set of Dragway car dollies is perfect for moving almost anything. There are a couple of minor drawbacks to be aware of, but nothing that will make this anything less than the best car dolly for your money. For example, the hydraulic mechanism has a tendency to lose pressure as some floor jacks do over time, but you can avoid that by using the device as specified by the manufacturer, plus the fact that there is a full 1 year manufacturer’s warranty included. Other than that, the only other problem worth mentioning is the weight– 39 lbs per tire dolly– and that may affect your storage and transportation possibilities. Might want to check out the DJS Dollies. Hands down the best out there. In today’s world, most of the industrial heavy workload easily move and managed by the castor wheels. However, these castor wheels are most effective when they are used in applications for which they designed for. Thanks for sharing.